It’s been a crazy few days. Most of you have probably heard that the Steele Knights football team lost on Saturday night. It was one of the most intense games that I’ve watched in a while, and we were able to come back from being down by three touchdowns in the third quarter. Ultimately we were behind by 1 point and went for the 2 point conversion to win, but didn’t get it, and ended up losing to Johnson in the final seconds of the game (41-42). I am so very proud of Scott though. He has been under tremendous pressure ever since accepting his new position as Head Football Coach and Athletic Coordinator for the Steele High School campus, and he has really put his whole heart and soul into his work, day in and day out. I know it didn’t end the way we all wanted, but I honestly could not possibly be more proud of him, all of the coaches, and the players, parents, teachers, and administrators who support our team. Honestly, I cannot find the right words to express exactly how impressed I am. It was a phenomenal season and while I’m glad that Landri and I will be seeing more of Scott these days, I am already excited for next season! 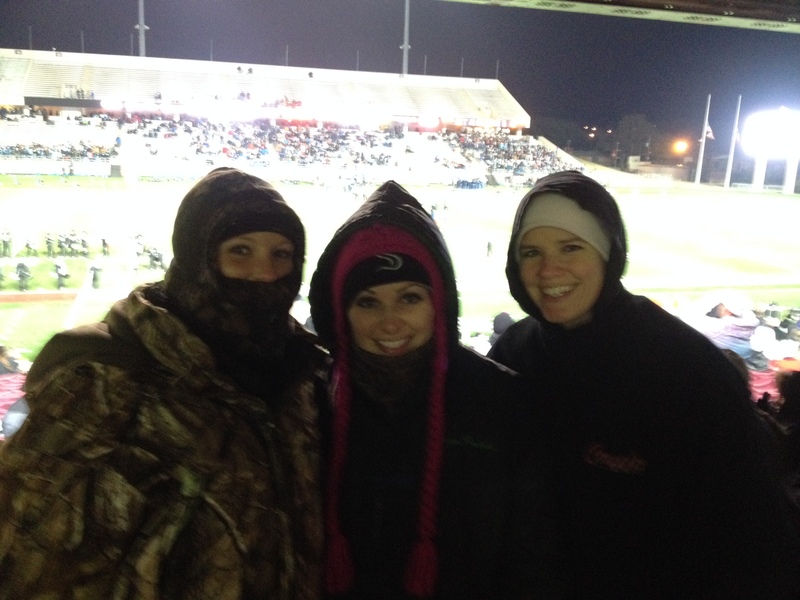 So it was cold at the game – really cold – like 30 maybe, with some wind and a lot of humidity. I wore my snowsuit which was awesome and kept me totally warm (see previous post). But guess what happened the next day! We ran out of propane at our house. Yes, this means no heat and also no hot water. It was the weekend and we had to wait until dinner the next day to refuel. To make life even more interesting, Landri has some crazy baby diarrhea going on, blowing out multiple diapers and at LEAST one outfit per day if not more. Kind of interesting because she’s barely eating so not sure where her massive “gifts” are coming from…Oh and the best part? When she threw my GPS watch into one of her diapers in the middle of getting changed. Yes. Right into the pile of rhea (wince). Silly me had given it to her to occupy her so we didn’t have another diaper punting situation (https://livinwiththelehnhoffs.com/2013/11/19/warning-this-post-rated-p/). Talk about a back fire! And by far the most difficult part of the last several days… Last night I found out that Landri has gained another guardian angel as her great-grandmother, my maternal grandmother, has passed. The date is kind of interesting – Dec 9 would have been my father’s 67th birthday. Now they are both looking down on us, keeping us safe. Many of you have asked me where Landri’s middle name comes from, and it’s from this wonderful woman. My grandmother, Marilynn Hetzler’s maiden name was Adair, and Landri, along with me and all of my female cousins and second cousins all share it in her honor. We will miss her very much and are so glad we were able to spend time with her this summer in North Carolina at the beach. She was a beautiful lady inside and out. Hugs and kisses to my mom, all of my aunts, uncles, cousins, and especially my grandfather. XOXO. Previous Post Overkill? Vote here.